Enjoying a foreign country also means exploring the local cuisine. In this case Turkey is one of your best choices, the variety of dishes is enormous and the quality excellent. The food is always fresh and the rich offer of vegetables and fruits display at local markets shows it the best and you can be sure that all the products from the field are without artificial fertilizers. With the added pleasure of dining outside on the aft deck of your gulet, the culinary experience can be a memorable part of your yacht charter. 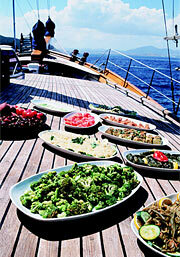 Your cook on board will serve dishes to have you lingering over meals, determined to discover the secret ingredients. Whilst on board, your day will start with traditional Turkish breakfast, consisting of white cheese, similar to the Greek 'feta', olives, slices of cucumber and tomato, eggs, honey and jam. Bread is a particular treat - freshly baked every day and dangerously more-ish! At breakfast and throughout the day you will also be served the Turkish tea (called 'çay',) tea which is quite strong and served in small glasses without milk, of course, also coffee is served on board if preferred an some boats even carry a filter coffee machine, to prepare the coffee the German way. A light lunch is next in line. Meals commence with 'mezes', or starters. Vegetarians relish these dishes:- egg plant (aubergine)or zucchini salads, hot and peppery tomato salad and 'cacik', yoghurt with finely shredded cucumber and lashings of garlic. Yoghurt is often served by itself, thick and creamy it's a good accompaniment to some of the drier mezes. Other favourites are 'dolma' ; green peppers and vine leaves stuffed with savoury rice, or even octopus caught by the crew, made into a salad or battered and fried; sprinkled with lemon juice it has a piquant flavour all of its own. Your table is never without a constant supply of fresh bread, helping you to savour every last mouthful of spicy sauce. Main courses are lamb, beef or chicken based, never pork as Turkey is a Muslim country. Herbs and spices are used liberally in Turkish cooking in dishes such as 'köfte'; the spicy Turkish version of meatballs, meat and vegetable casseroles, pasta and barbecued dishes. 'Pilav', savoury rice often accompanies main courses, and a salad tossed in olive oil and lemon juice. Your gulet crew or local fishermen can supply fresh seafood, amongst the best are 'levrek' sea bass', 'karides' prawns, 'barbunya' red mullet and 'kiliç' sword fish depending on season. common is 'Baklava' a honeyed nut filled pastry. For the finale try Turkish coffee, thick and bitter with grains resembling mud, but nevertheless sweetened precisely to your taste. Liquid assistance is a must when embarking on a journey of gastronomic discovery. For Turkish people 'raki' is the ultimate accompaniment to any meal. The novice should beware however when partaking of this aniseed flavoured beverage, its potent effects are frequently delayed. Imported spirits are available but always more expensive than the local variety which are a bit of an acquired taste. Turkish wines are reasonably priced and the quality seems to be constantly improving. Teetotallers are well catered for with a selection of refreshing soft drinks such as peach, apricot and cherry juice. Local drinks are excellent accompaniments to dinner - try raki with water and ice for a traditional touch, local beer for extra refreshment, or perhaps one of Turkey's range of home produced wines. Without doubt dining in Turkey is a pleasurable experience, existing tastes are satisfied and many new ones acquired. In an atmosphere of congenial hospitality the innate Turkish ability to turn a simple meal into a warm hearted feast is infectious and when you express your pleasure the response will be a resounding 'Afiyet Olsun! ', Bon Apetit!